Our bakery, café and restaurant at 29 Bedford Street was the first branch of PAUL in the UK and is just behind the beautiful St. Paul’s Church, designed by Inigo Jones and consecrated in 1638. Bedford Street was originally built between 1633 and 1640 and runs north from The Strand to King Street. You will find PAUL almost on the corner of King Street in the heart of Covent Garden, just a few minutes’ walk from the Piazza (a building dating from the 1830s) with its busy markets and eclectic boutiques, as well as the Royal Opera House, The London Transport Museum, The London Coliseum, Leicester Square, Trafalgar Square, The Strand and Drury Lane, making us the perfect destination for visitors, opera buffs, balletomanes and theatre goers alike. 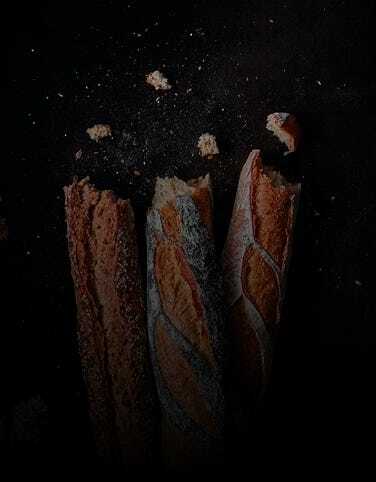 Tucked away behind our bustling bakery with its fabulous selection of bread baked daily on site, you will find one of the two London branches of Le Restaurant de PAUL, offering all-day French brasserie-style dining. Our French restaurant has an unmistakably Parisian look that combines the contemporary with the classic. Three large 19th Century murals are complemented by soft grey coloured banquettes and plush teal seating. Industrial style ceiling lamps and stone floor tiles to the rear of the restaurant complete an intimate and stylish dining environment. Open for breakfast, brunch, lunch, a splendid afternoon tea and dinner, or just for coffee or tea and a delicious croissant, cake, éclair or slice of fruit tart, we also have a pre-theatre supper set menu served from 5.30 pm so you won’t miss the show. Closest stations are Leicester Square (Piccadilly Line, Northern Line), Covent Garden (Piccadilly Line) Embankment (Northern, Circle, District and Bakerloo Lines) and Charing Cross (Northern Line, Bakerloo Line and national rail services). 64 seats are available. Disabled access available. Free Wi-fi.